After the initial introduction of the T-Charge back in October 2017, Mayor of London, Sadiq Khan, wants to further the capital's efforts in leading the way towards providing a solution to the ever-growing issue of air pollution produced by vehicles on the nation's roads. The Mayor of London, announced plans in 2017 to implement an Ultra-Low Emission Zone (ULEZ) across London by April 2019 - But what does this mean for the capital's drivers? Essentially, the ULEZ would result in the most-polluting vehicles having to pay a daily charge to enter central London starting from the 8th April 2019. This charge will be applicable 24 hours a day, 365 days a year and affects drivers of cars, motorcycles, vans, minibuses, buses, coaches and HGV's whose vehicles fail to meet the minimum exhaust emission standards. Drivers of petrol vehicles that don't meet Euro 4 standards and drivers of diesel vehicles that do not meet Euro 6 standards will have to pay a ULEZ daily fee of £12.50. For those living within the zone, the Government is implementing what they are calling a "sunset period" from April 2019 to April 2022, where residents will not be charged due to the fact they will be unable to avoid driving in these areas. These harsh measures have come about after a number of studies have shown there has been a significant rise in health issues caused by CO2 emissions and harmful Nitrogen Oxide (NOx) gases in recent years. At the beginning of August, researchers from Oxford University and Queen Mary University released information from a study detailing symptoms of heart failure developing in those living within areas exposed to high amounts of vehicle exhaust fumes. Dr Nay Aung of Queen Mary University said, "Air pollution should be seen as a modifiable risk factor." The British Heart Foundation, who funded the study, found a clear link between those living within busy cities and those exposed to NOx. It has been estimated that ULEZ could result in nearly a 50% reduction of NOx emissions by 2020. Alongside ULEZ, the Department for Transport has stated it wants at least 50% of all new cars and 40% of new vans sold to have emissions of less 50g/km of CO2 by 2030, in a collective campaign it has labelled the Road to Zero Strategy. However, within the industry, this aim has been labelled as unrealistic and high-reaching by many as the European Union (EU) has set its target at a lower 30% in the same time frame. To reach Government's target of ultra-low emission vehicles (ULEVs) sold, a 20-fold increase would be required, with ULEVs currently taking up a 2.2% of the current market share. The increase for vans stands at an even higher rate, with only 0.3% of new vans on the market classed as ULEVs. Despite this, the British Vehicle Rental and Leasing Association (BVRLA) has vowed that its members will increase their annual purchase of new plug-in vehicles from 17,000 in August 2018 to 300,000 by 2025, in an attempt to meet the Government's Road to Zero targets. "Our numbers are significant and our members are committed," said BVRLA chief executive Gerry Keaney. "But the Government has an active role to play to facilitate an aggressive uptake." Keaney has highlighted three areas in which he believes government intervention is required. The first being the 2% BIK (Benefit in Kind tax) for electric vehicles (EV) brought forward from 2020 to 2019. The second being a commitment to five-year BIK rates and EV incentives, and finally further investment in infrastructure. "Road to Zero is a great first step, but it's not sufficient. The Government needs to do more and we urge them to engage with us,". To support this campaign the Government has responded by ensuring 25% of Government owned car fleet will be classed as ULEVs by 2022 and 100% by 2030. The Department for Transport has also included a few incentives within the Road to Zero Strategy to help increase the number of charge points within the capital and throughout. A £40m programme to develop and trial wireless and on-street charging will be launched, as well as providing up to £500 for EV owners to install a charge point in their home the Government has also launched proposal to increase the grant amount of the Workplace Charging Scheme from £300 to75% of the purchase and insulation costs. In addition, the Department for Transport has stated that there will be a role to play for diesel within the strategy, with Transport Secretary Chris Grayling stating, "Cleaner diesel vehicles can play an important part in reducing CO2 emissions from road transport during the transition to zero emission vehicles, while meeting ever-more stringent air quality standards,". It's clear that the changes within the London region / ULEZ are a positive step to improving air quality in the Capital. The wider ambition of Government towards lowering CO2 and harmful air pollutants is also positive in theory – although much work and investment will be needed to drive this forward if it's to stand a chance of success. Communication and education will be of paramount importance here – from our perspective, businesses and consumers are somewhat confused by the messaging – proven by recent statistics which show a sharp fall in the number of diesel registrations and a resultant increase in average CO2 emissions of vehicles registered. This is also, in part, being driven by an unfavourable tax regime for company car drivers; particularly those looking for diesel options. Looking for a simplified breakdown of what charges may apply when driving into London? Click here to watch our 2 minute video! 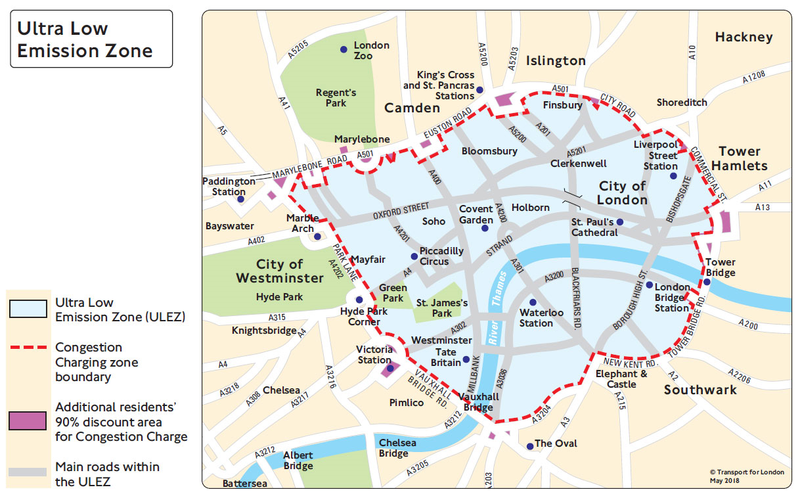 Click here to download more info on London's air quality schemes and the Congestion Charge.